Thursday night dad came over and cut the hay. It's been that hot that it's taken hardly anytime at all to make. 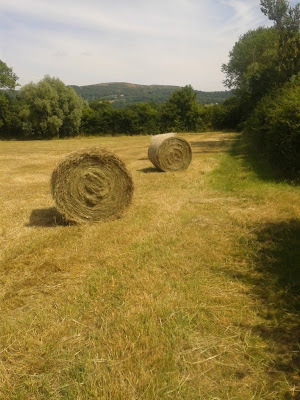 I turned it a couple of times over the weekend and decided that even though I'd booked the contractor, Spike, for Monday to bale it, it might have been too dry by then so I rang him up and he came over yesterday afternoon. We were having friends over for a BBQ as well so when they turned up I was covered in dirt and sweat as I had only just finished! It's a good job they know what I'm like! We made 22 and a half bales. Not a huge number by any ones standards but it keeps the place looking tidy until I find the time to get some more stock (and do some fencing), and should help fund some other things we need like gates and wire. Ken, I don't suppose you would put them in the post and send them down to us here in SW France! We'll pay the going rate plus postage! If you pay postage I'm sure I could get them down to you. Maqybe in the back of my transit! Nothing like the smell of fresh hay! I just put mine up loose where I can fork it over to the horse in the winter. I will need a couple rolls for the calves if we keep them that long. I think my horse likes the scythe cut hay as it has so much sweat on it. This is some sweet smelling hay as well. Not so much sweat in as yours although the tractor had a fair bit spilt on the floor as it was pretty hot in there! Love the pictures of fresh hayed fields! Yeah that last one is pretty good - just off my phone though! Good honest work it is as well. That is a fair patch of property you have there. 22 bales is a good harvest. Good job. This is just the begining! Well no, it's probably all I'll ever be able to afford but I'm happy with my lot! My memories of new mown hay and the images it conjurs were destroyed when during NBC (Nuclear, Biological & Chemical) warfare training we were told that certain types of nerve gas smell like new mown hay. Go and enjoy a day in the countryside after that! I imported my PVC coated 70mm mesh galvanised chain link fencing from China. 600 metres by 2 metres high cost me US$2700 and the over 200 60 mm x 2600mm posts another US$1700. I don't know how that compares with UK prices but that worked out at just over US 7 per metre for me which was a damn sight cheaper than the $50 per metre they were asking here. Since there are few of us rich enough to fill a whole container, we tend to club together and get four or five of us to buy enough of what we need to fill a container and then split the shipping costs between us. Don't know if you have enough farming friends to fill a container with chain link, posts, strainers and brackets but, if you were interested, I could give you the name of the agent in China. His name is Gary and he speaks perfect English and really puts in the hard work to get you the kit you want and see it gets shipped. You may have picked up that my trucks are Chinese (with Isuzu running gear). A three tonne drop side truck, US$ 10,000. A Cummins silenced 100 Kva generator with Stamford alternator, US$9,600. 3000 hour spares kit for the same, $2,000. With so many small holders in UK, I am amazed the Chinese don't have dealerships in UK for light tractors and implements because they are ridiculously cheap, run on almost anything and can be fixed with a lump hammer and an arc welder! Just what we need here in Africa. I'd hate to have that smell wrecked for me! It brings back memories of growing up on the farm helping dad with harvest and feeding the sheep in the winter. Not GAS GAS GAS! My fencing will probably be stock fencing (pig netting) as the "wildlife" I have to keep out isn't as adventurous as yours! I like the idea of importing tractors though! Mind you I've never been a big fan of little trctors. I think it makes more sence to have a full size one as all th kit for it is normally cheaper as it's made on such a larger scale. Also I think it's about time you upgrade to a mig welder - much easier! Big Big Don Alviti got his three sons together. ‘I’m gonna be your loyal Capo, Pappa’, he said. ‘Bene, bene’, said the Big Boss, patting his first born on the head. 'Here's a hundred dollars'. ‘Howza about you?’ he demands off the next lad. ‘I’m going to be a farmer, Father’ Kev Alviti replied. ‘There’s a couple of free acres to start with’. Ha - that made me laugh! been a while since dad kicked me in the balls though ... Mind you, my dad has always wanted me to be a farmer (a proper one, not like the pretend one I am!) Then I could take over the family business! For my next child, if it's a boy I have a name that I'm a 100% sure you will like as it goes with Alviti rather well. But we've another 12 weeks to wait to find out what flaour the next one is!